I know you guys like before and after shots so I'm really excited to show you how much we have transformed our family room. 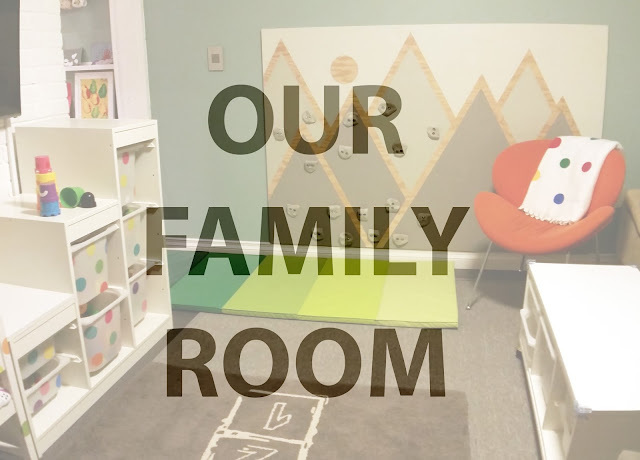 It has actually made a huge difference to our family to have this extra little space where we can hang out as a family. It's mostly a play space for Rudy, but Corey and I often find ourselves hanging out there in the evenings to watch movies or read. 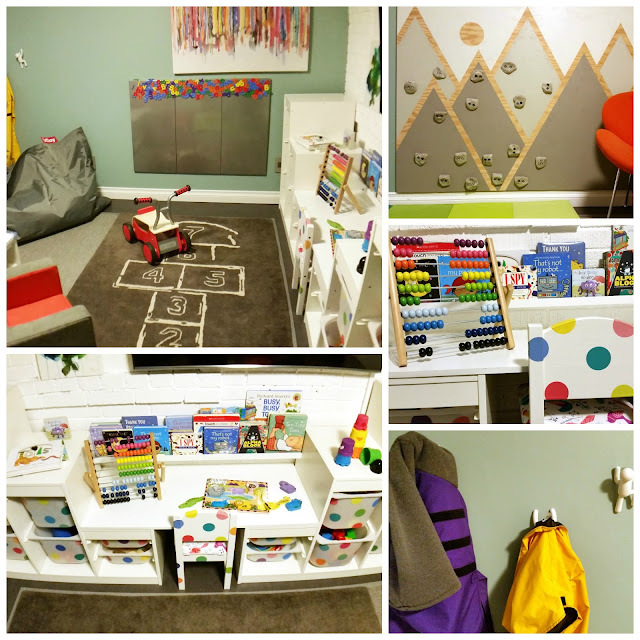 It has become our happy space and isn't that really the point of customizing your home? 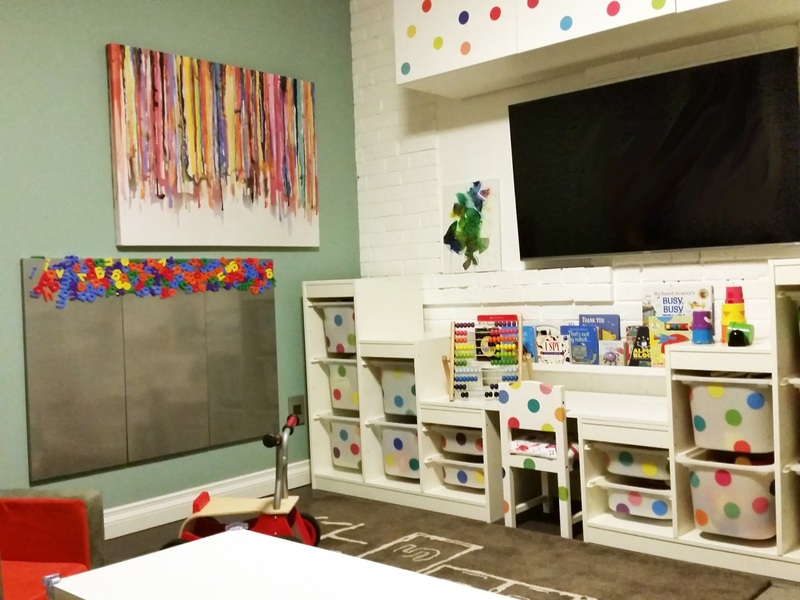 When we began decorating, we made a decision to keep everything colourful and fun. This is not a sophisticated room but rather a place for us to be silly and connect as a family. It looks like a five year old decorated it but that just adds to the fun! Here's the opposite angle. These photos were taken from the entrance of the kitchen facing the door to the yard. As usual, in our small house, there is usually thought behind every decorating decision. Here are some things to note about our space. We finally broke down and bought a television! Since the family room is an addition, we didn't get great signal strength for the internet in the family room before. Corey had to run a new hard-line and set up a new access point but now we can watch Netflix and Bubble Guppies to our heart's content! We also mounted it to angle downwards, so that we can adjust it if Rudy is watching something from the floor. 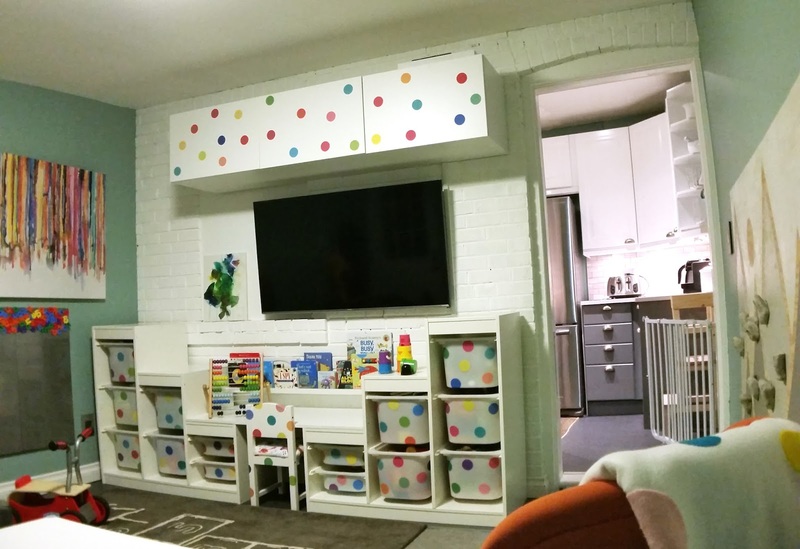 The storage unit above the TV is from Ikea and we just decorated it with some wall decals. It's a good place to hide the DVD player as well as any craft project I'm working on and anything we don't want Rudy getting into. I've already blogged about Rudy's Ikea hacked desk. 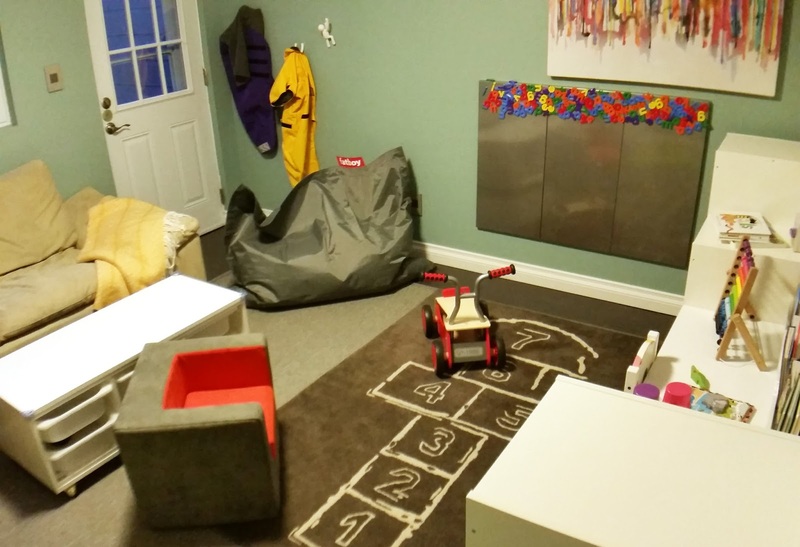 It has given us a lot of toy storage as well as a flat space for her to work and play. The book ledge is actually an Ikea photo ledge, which is the perfect width to allow us to keep a few books downstairs for Rudy. Many of you have asked about Rudy's alphabet magnet board. It's actually just three Ikea office magnet boards mounted together. The magnet letters are from Toys R Us. Some of you ask why the magnets are always up high in the photos I post on social media and the answer is that they present a bit of a choking hazard so we like to supervise Rudy when she plays with them. Their default position is just out of reach for her. The "motorcycle" is actually both a walker and a ride on toy. Right now, Rudy loves walking it backwards around the room. Her legs are still a little too short to ride it. She absolutely loves it now, but it may lose some of its novelty once she starts walking on her own. Since the family room is an addition to our house, it will never be as warm in the winter as the rest of the house. Corey added lots of insulation by crawling under the addition... Yes, he is a CHAMP! In addition, we find that our Marmoleum flooring adds some warmth and a tiny bit of softness, since it is backed in cork. We love our "Better Than Sisal" rug from Urban Barn. We have one already in the nursery but we bought an 8 X 10 to cover the entire floor of the family room to insulate our feet from any cold that makes it up through the floors. We love that it's easy to clean and not picky against our skin. It was also important that any rug be hard enough that it wouldn't interfere with blocks and toy cars. 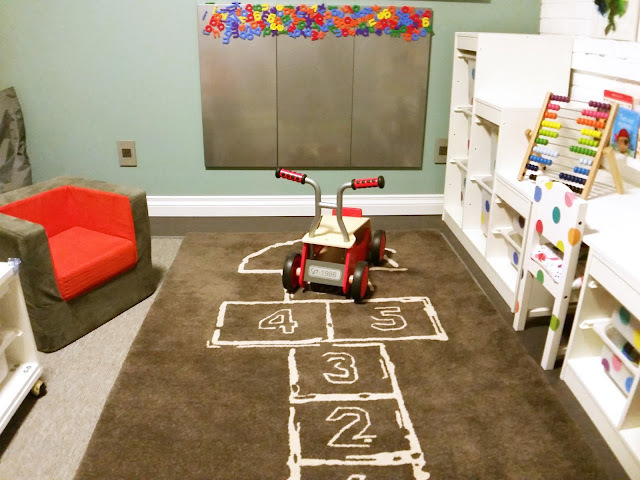 We also layered the CB2 Hopscotch Rug in front of Rudy's main play space. I confess that I've wanted this rug long before I had even thought about having children. The rug was for ME... but Rudy was a good excuse to buy it. Just like at daycare, we wanted Rudy to feel like this was her space too so there is furniture that is just her size. She has a little chair at the desk as well as a lounge chair to curl up in and watch "Bub Gups", which is what she calls Bubble Guppies. 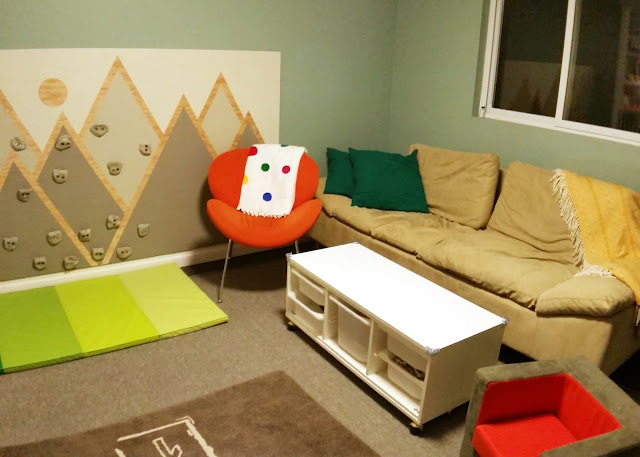 We also have a great beanbag chair which serves as extra seating for a kid or adult! See those little people climbing the wall? Those Umbra hooks serve as a good place to hang a coat (currently the dog's coats) to dry after playing outside in the yard. They are so cute that they don't look useful at all... but they are! You may have noticed that there are still no curtains on the window. We are looking forward to the day when we can add custom blinds to the room but for now, Rudy likes to climb the back of the couch (and she keeps trying to get her little legs up on the window sill) and I'm terrified that she'd use any window coverings as leverage. That's Corey's couch you see in the corner. It was a Craigslist purchase from years and years ago and Corey loves it so much that (despite my protests) he won't let me get rid of it. If he doesn't give in in a year or so, I may have it covered in a nicer fabric. You'll also notice our coffee table, which contains extra storage and is on castors... Just in case we need to roll it to the side for a spontaneous dance party! All the cozy blankets aren't just for show. We use them all the time to stay toasty in the winter. 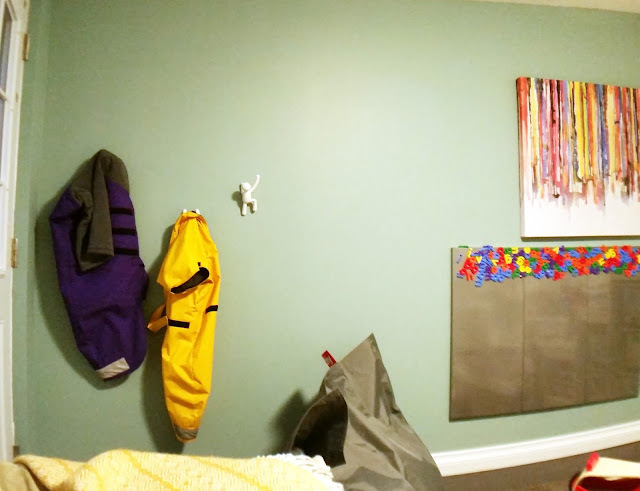 Yes, we are crazy people who built their baby a climbing wall. I'll share the "how to's" in a later post but we wanted to encourage some horizontal (safer) climbing than the back of the couch. 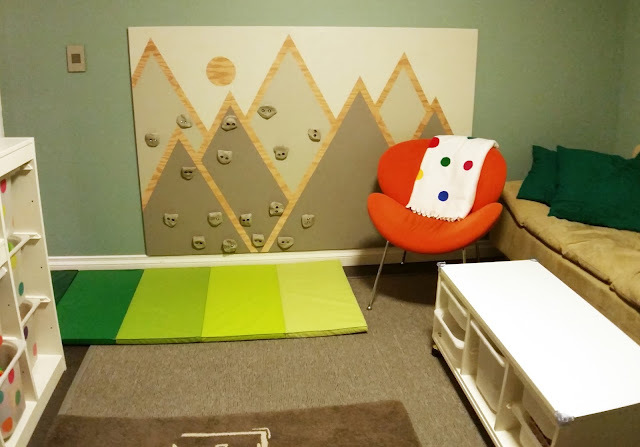 The Ikea mat under the climbing wall is usually folded and stored under the couch. Well, there you have it. It's our new favourite room in the house. It's only a little over 10 X 10 but we've packed a lot in and it's pure fun! I think our next big project will be the master bedroom. Stay tuned!